Virtual Ecosystems | 3-D Change, Inc. In our earlier explorations of “the Complexity Space,” we introduced the concept of “ecosystems.” Ecosystem Dimensions are the deep patterns and structures that create the initial conditions for operation and change in complex adaptive systems. They are difficult, if not impossible, to change directly, yet they influence virtually every aspect of system function. Context refers to the surroundings in which the particular system operates. Recognizing the economic, demographic, political, competitive, and technological environments provides insights into the constraints and opportunities for the system. Culture refers to “What and how we do things at our core.” Borrowing the distinction between “espoused theory” and “theory in action,” culture often manifests itself in how the system reacts in stressful or ambiguous situations. The difference between how Johnson and Johnson handled the Tylenol crisis and Exxon handled the Valdez crisis provides a case in point. 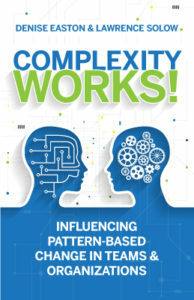 A new distinction has emerged as we continue to explore the complexity space. We recognize that the various elements of the ecosystem are “virtual”—that they exist at a particular place and time. When we speak of “place,” we are speaking of physical location – whether a particular office, shop floor, building, campus, city, state, region, or country. Each of these, individually and collectively, serve to influence – and be influenced – by the organization’s history, context, and culture. An example. I was recently assigned a partitioned office by a client. As I was settling in, other employees in the area came by to say hello. They mentioned to me they hoped I would have better luck than the prior three inhabitants of that office space, each of whom had left the organization after only a few months. That brief conversation was incredibly unsettling to me. Was my placement in that office based on an expectation of my future performance? Was I being set up to fail? Would other employees make judgments about my performance based on my office location? Were the employees raising the issue warning me? Belittling me? Did they care about my best interests? History. Context. Culture. All made manifest in one brief conversation. A second example. In the mid-1990s, a consulting client was engaged in acquiring another company in the same industry. One was based in Texas, the other in California. On paper, the economics of the combination were fantastic. Implementing the acquisition proved to be far more difficult. The technical challenges of merging IT systems, pension plans, etc. were known and were steadily revolved. The unanticipated problems resulted from two very different ecosystems. These differences were captured distinctly, albeit pejoratively, by an executive from the acquiring Texas company who said that they were dealing with a difference between the “steers” and the “queers.” The ecosystem of the Texas company was one of aggressive action, decisions, and a “take no prisoners” decision mentality. In contrast, the California firm preferred to move more slowly and deliberately, employing consensus as its preferred decision-making style. Each organization had enjoyed a history of success in its preferred method of operation. Each company’s long track record of success made finding common ground much more difficult. These two examples illustrate how the “place” dimension of “virtual” can impact systems at any level of geography. The other dimension of virtual is “time.” Heraclitus said, “You can’t step in the same river twice.” One of the dimensions of organizational systems is that they are constantly changing and evolving. Those changes are sometimes very subtle – and other times, very dramatic. Sometimes, a great deal of effort is put into orchestrating a particular change, only to not achieve the desired result. In other cases, a chance encounter – an “off the cuff” statement, has tremendous repercussions.